3 customer has rated this product. Click on the tab below to view more details. As a dietary supplement slowly add one scoop (scoop included) of Super Collagen Powder to a glass of water or juice once daily. Works best with a hand blender. Vitamin C works synergistically with Super Collagen Powder and it is recommended that either juice containing vitamin C or a Vitamin C supplement be taken with the Super Collagen Powder. I use this product as a part of Bulletproof coffee every morning. After just a couple of weeks, I noticed an improvement in skin appearance, but also experienced some new hair growth (unexpected benefit). 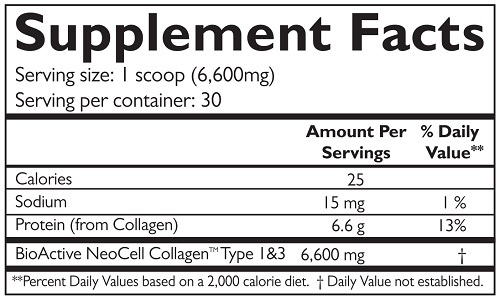 Compared to other collagens I&#039;ve tried (particularly a fish-based product), this is far superior. Very happy I discovered this supplement for myself! It shows great results - my skin looks healthier now!! Technically this is a good product however the taste is dreadful even if mixed with orange juice. It may be good if you are a regular smoothie drinker and add the powder in this way. The flavor is so unpleasant that for me I can&#039;t continue using it which is a shame as powder is more effective that tablets.